Walt Whitman was born 190 years ago, on May 31st, 1819. The portrait above courtesy of Library of Congress, Brady-Handy Photograph Collection. The Opening History aggregation includes two digital collections about the famous poet: Walt Whitman Archive and Integrated Finding Aid to Walt Whitman Manuscripts. There are also some interesting items about Walt Whitman in a number of other digital collections in Opening History. For example, listen to audio recording of Allen Ginsberg teaching a class on Walt Whitman and negative capability at Naropa Institute in 1987 (1 hr. 20 min. ), courtesy of Naropa Poetics Audio Archives collection, part of a larger Heritage West digital collection. May 29th is the International Day of United Nations Peacekeepers. Peacekeeping has been developed by the United Nations as a unique “way to help countries torn by conflict create the conditions for lasting peace.” Since 1948, over 60 UN peacekeeping operations took place around the world. The first UN peacekeeping mission was deployed in 1948 to monitor the Armistice Agreement between Israel and its Arab neighbors. The photograph below, courtesy of University of California in Los Angeles, Ralph J. Bunche Papers digital collection, shows signing the Egyptian-Israeli Armistice Agreement on February 24, 1949. Isadora Duncan, “the mother of the modern dance”, was born on May 26, 1877, in San-Francisco. 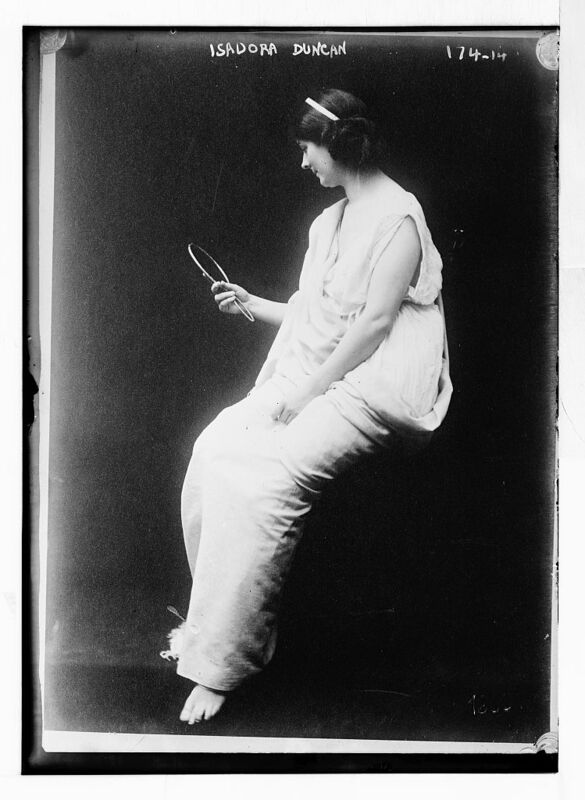 The portrait of Isadora Duncan in Toga with looking glass above, courtesy of Library of Congress, George Grantham Bain Collection . Long after her death in 1927, Isadora Duncan continues to inspire artists and dancers worldwide. The poster below, courtesy of Colorado State University Library, International Poster Collection. Famous aircraft engineer Igor Sikorsky was born on May 25th 120 years ago, in 1889. Sikorsky developed the first stable, single-rotor, fully-controllable helicopter. In 1942, his Sikorsky R-4 model became the first mass-produced helicopter in the world and the United States Air Force’s first service helicopter. The majority of subsequent helicopters were based upon this model. The photograph below, titled “Igor Sikorsky and the first successful helicopter built in America, Stratford”, courtesy of Connecticut History Online digital collection, pictures Igor Sikorsky piloting R-4’s predecessor — experimental VS-300 helicopter — in 1940. May 22 is the International Day for Biological Diversity. The item featured below, courtesy of Making of America digital collection (part of Opening History aggregation), is a full-text digitized version of a 1854 Louis Agassiz’s book titled The Primitive Diversity and Number of Animals in Geological Times. International Museum Day is celebrated all over the world on May 18th, since 1977. Each year, a theme is decided on by the International Council of Museums Advisory Committee. This year’s theme is “Museums and Tourism”. Sixty-seven digital collections in Opening History aggregation are hosted by and/or contributed to by various kinds of museums: history museums, science and technology museums, natural history museums, art museums, etc. The image below courtesy of the Skyscraper Museum‘s Erection Views of Empire State Building collection, part of a larger Visual Index to the Virtual Archive of the Skyscraper Museum (VIVA2) digital collection.